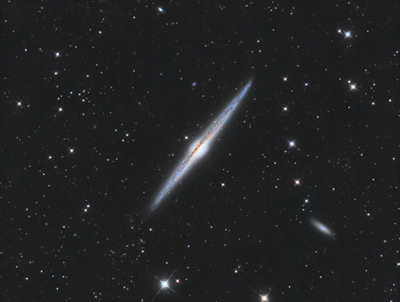 2016/04/25 - Messier 106 (also known as NGC 4258) is a spiral galaxy in the constellation Canes Venatici. It was discovered by Pierre Méchain in 1781. M106 is at a distance of about 22 to 25 million light-years away from Earth. It is also a Seyfert II galaxy. Due to x-rays and unusual emission lines detected, it is suspected that part of the galaxy is falling into a supermassive black hole in the center. 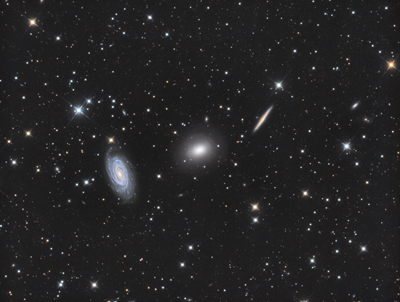 NGC 4217 is a possible companion galaxy of Messier 106. A Type II supernova was observed in this galaxy in May 2014. 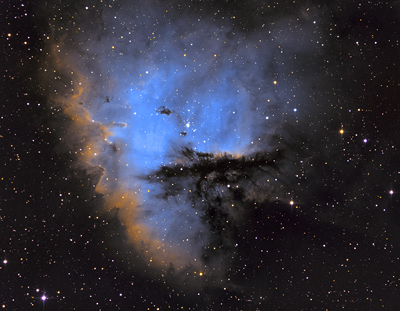 2015/12/09 - NGC 1579 (also known as the Northern Trifid) is a diffuse nebula located in the constellation of Perseus. 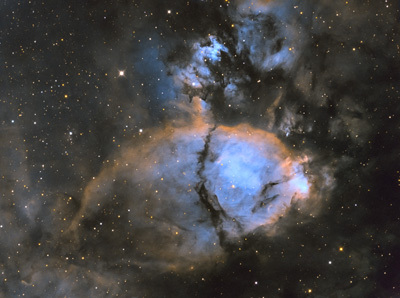 It is referred to as the Northern Trifid because of its similar appearance to the Trifid Nebula, which is located in the southern celestial hemisphere of the sky. 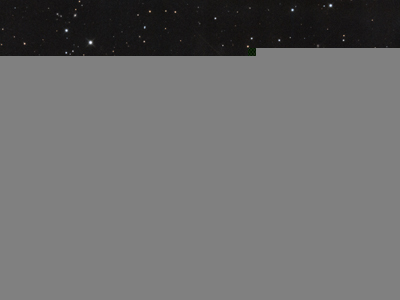 It is a H II region, a region of star formation. 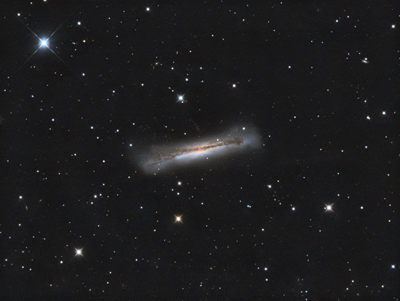 2015/11/15 - NGC 772 (also known as Arp 78) is an unbarred spiral galaxy approximately 130 million light-years away in the constellation Aries. 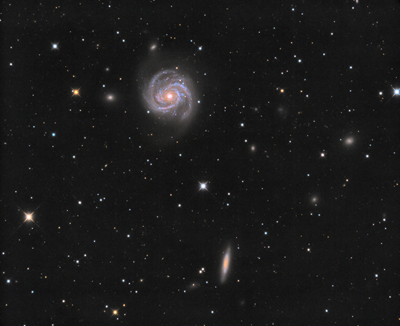 Around 200,000 light years in diameter, NGC 772 is twice the size of the Milky Way Galaxy, and is surrounded by several satellite galaxies – including the dwarf elliptical, NGC 770 – whose tidal forces on the larger galaxy have likely caused the emergence of a single elongated outer spiral arm that is much more developed than the others arms. 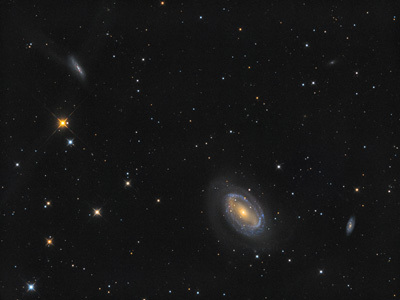 Halton Arp includes NGC 772 in his Atlas of Peculiar Galaxies as Arp 78, where it is described as a 'Spiral galaxy with a small high-surface brightness companion'. 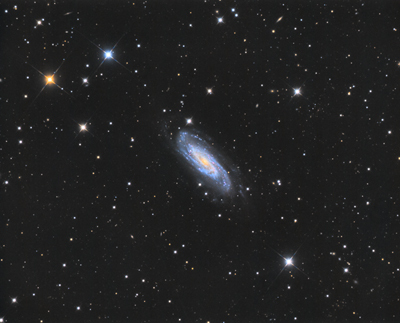 Two supernovae (SN 2003 hl & SN 2003 iq) have been observed in NGC 772. 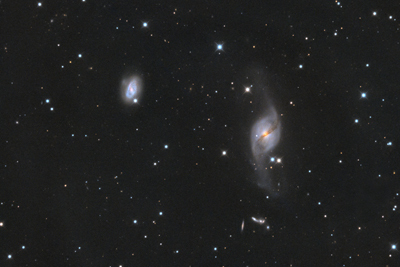 NGC 772 probably has a H II nucleus, but it may be a transitional object. 2015/11/06 - We had some issues with our focuser, so I had to reject lots of out-of-focus images. 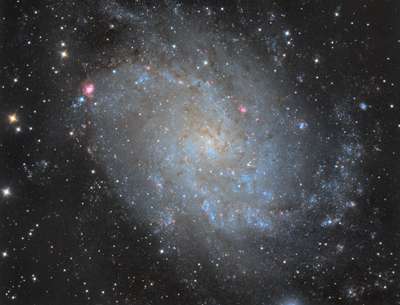 With the remaining images I managed to create this image of M33. 2015/05/22 - Messier 63 (also known as M63, NGC 5055, or the Sunflower Galaxy) is a spiral galaxy in the constellation Canes Venatici consisting of a central disc surrounded by many short spiral arm segments. 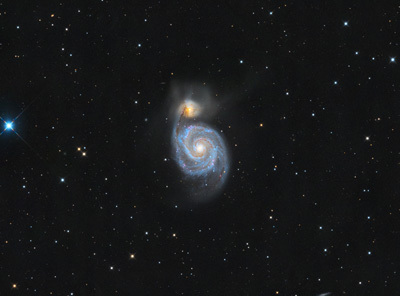 M63 is part of the M51 Group, a group of galaxies that also includes M51 (the Whirlpool Galaxy). 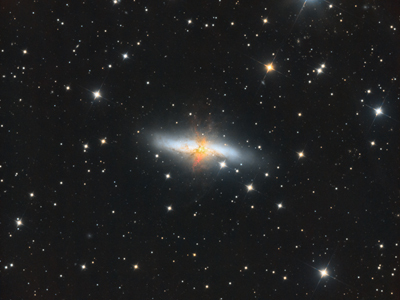 2015/03/12 - Messier 82 (also known as NGC 3034, Cigar Galaxy or M82) is a starburst galaxy about 12 million light-years away in the constellation Ursa Major. It is about five times more luminous than the whole Milky Way and one hundred times more luminous than our galaxy's center. The starburst activity is thought to be triggered by interaction with neighboring galaxy M81, and M82 is a member of the M81 Group. 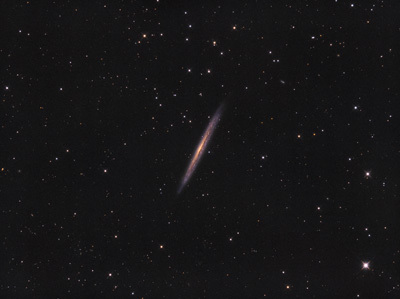 As the closest starburst galaxy to our own, M82 is the prototypical example of this type of galaxy. SN 2014J, a Type Ia supernova, was observed in the galaxy on 21 January 2014. In 2014, in studying M82, scientists discovered the brightest pulsar yet known, designated M82 X-2. 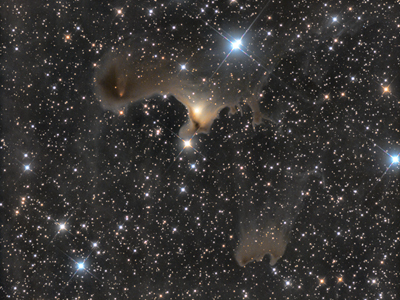 2014/08/23 - The North America Nebula (NGC 7000 or Caldwell 20) is an emission nebula in the constellation Cygnus, close to Deneb (the tail of the swan and its brightest star). The remarkable shape of the nebula resembles that of the continent of North America, complete with a prominent Gulf of Mexico. 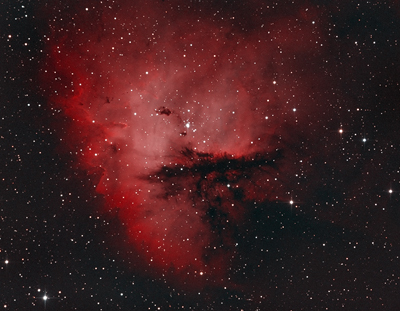 It is sometimes incorrectly called the "North American Nebula". 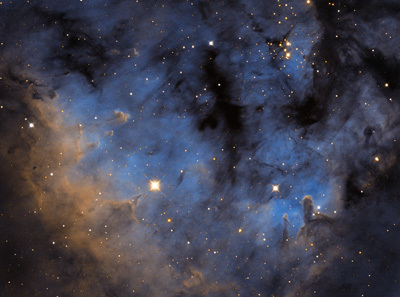 The North America Nebula is large, covering an area of more than four times the size of the full moon; but its surface brightness is low, so normally it cannot be seen with the unaided eye. Binoculars and telescopes with large fields of view (approximately 3°) will show it as a foggy patch of light under sufficiently dark skies. However, using a UHC filter, which filters out some unwanted wavelengths of light, it can be seen without magnification under dark skies. 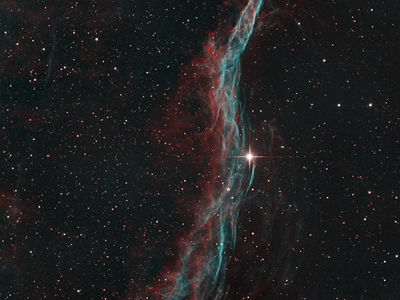 Its prominent shape and especially its reddish color (from the hydrogen Hα emission line) show up only in photographs of the area. 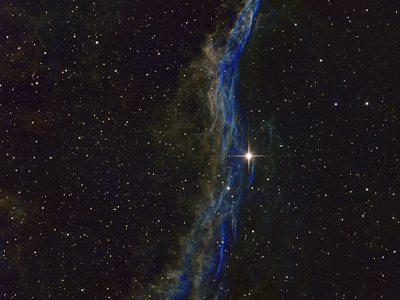 Cygnus's Wall is a term for the "Mexico and Central America part" of the North America Nebula. 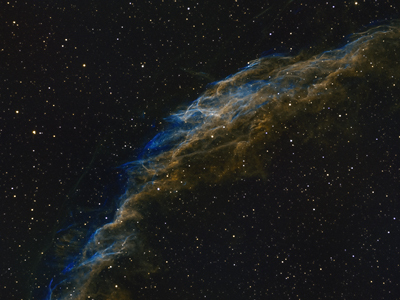 The Cygnus Wall exhibits the most concentrated star formations in the nebula. 2014/08/23 - Fifth light of our remote setup. We spent almost 34 hours on this object. Conditions weren't good; bad weather, moon and seeing interfered. So it took us more than a month, 12 sessions, to gather some decent data. 2014/07/17 - Fourth light of our remote setup. 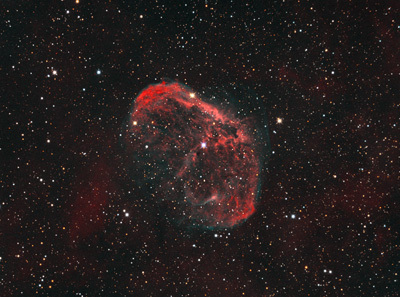 This time a nice narrowband object, The Crescent Nebula. 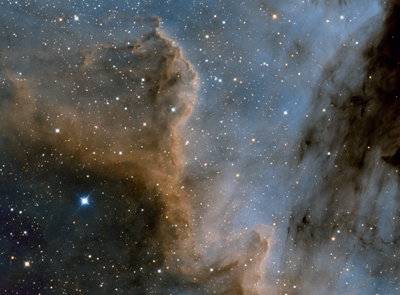 This image is a combination of 6 channels; Hydrogen-alpha, Oxygen-III, Sulfur-II and RGB for correct star color. We spent 35 hours on this object, that's our record for now. Seeing fluctuated during the 8 days we images this object, it was between 2" and 5". 2014/06/20 - Third light of our remote setup. We still needed 1 hour of red data, but I lost all patience after a period of three weeks of no imaging. 2014/05/25 - This is our second light of our robotic remote setup. 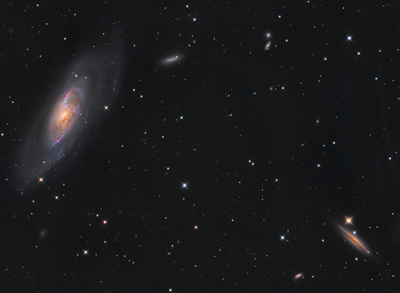 It took a while to gather all the data, but finally after two months I can present our spring object NGC4565. Weather wasn't always that good, and I had to reject lot of failed lights because of the moon and clouds. But we still gathered a nice set of data. 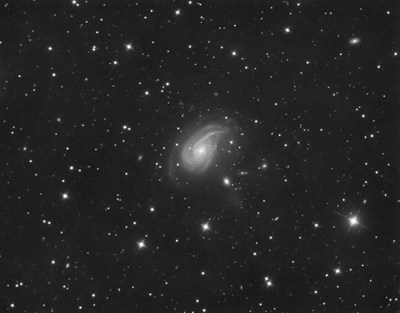 2014/03/26 - I spent two night on M100 and NGC4312. The Moon rose late so I had a nice black sky. The second night there were some clouds, so I rejected some frames. FWHM was between 2.28" and 3.18". 2014/03/11 - The Moon was up and almost full when I imaged this object, so the data isn't good. I really need to shoot some new data for this object when the Moon is gone again. 2014/03/08 - Finally!! After months of preparation and testing, I (we) can present our first light of our robotic remote telescope which is located under perfect dark southern French skies! We chose a galaxy, because of course it's galaxy season. We began our preparations late 2012, started testing mid 2013, installed the setup onsite late 2013, and now I can present our first light. We still need to tweak lots of settings, but I'm very happy with this first product, up to the next one! 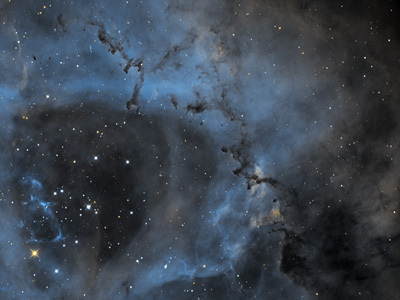 2014/03/07 - I spent two nights on this galaxy. 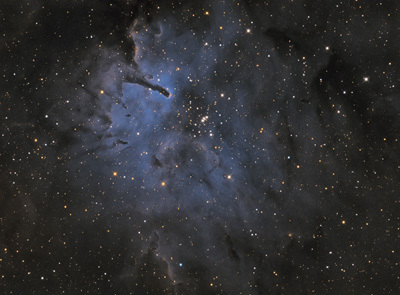 It wasn't the best data, because of an interfering Moon and passing clouds. FWHM was between 2.08" and 3.57". 2014/02/26 - Conditions were not too good. I needed to delete some frames because of passing clouds at the beginning of the session. The rest of the night was pretty good; FWHM between 2.44" and 2.84". Because of the clouds I wasn't able to shoot new flats, so I used old flats which don't function optimal. I also needed to crop off a reasonable big area with reflections, don't know what caused it, but I think I'll will remove the CCDT67 reducer. And I surely need to collimate the OTA again. 2014/02/24 - I needed to test the setup again after some updates of CCDAutoPilot and FocusMax. Everything worked great. Too bad weather is still horrible around here. I really need some clear skies to acquire some good data. For this reason I only shot Hydrogen-alpha. I'm not much of a black & white guy, but I didn't have a choice. FWHM was between 2.39" and 2.77". 2014/02/02 - Finally, afters months of bad weather I was able to shoot this galaxy. Preparations for the remote robotic setup are finished, so I could setup my own gear again. 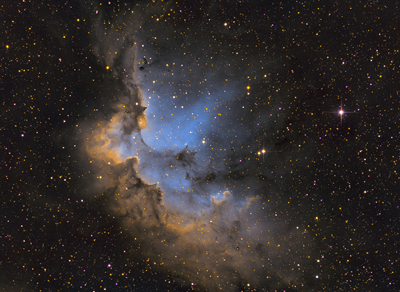 The ASA DDM60 and 10" RC behaved perfect, resulting in this image. 2013/10/07 - I wanted to spend more time on this object, but weather isn't cooperating. 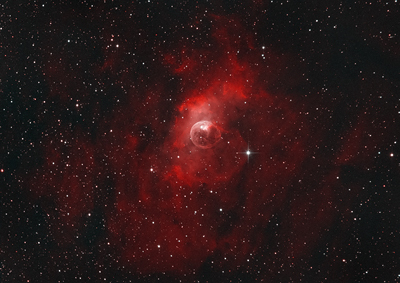 This nebula is part of the Heart Nebula, but that object is too big for this field of view. 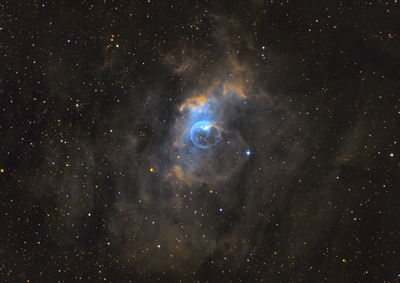 2013/10/02 - After a long break I spent 2 nights on this nubula. I had to setup my equipment again. So after a quick polar alignment I made a small pointingmodel and I could start imaging. Ran two automated sessions on this object with narrowband filters. I shot some extra RGB data to correct starcolors. Seeing was around 2.5" FWHM. The night sky is becoming darker again with a SQM 19.7 sky. 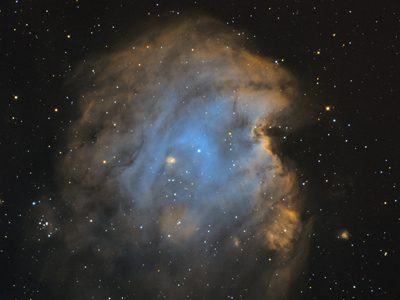 2013/06/08 - The nights are very short this time of year, so I spent five nights gathering data of this nebula to get the brown color. It wasn't easy under a SQM 19.14-19.55 sky. Seeing was between 1.97" and 2.84". 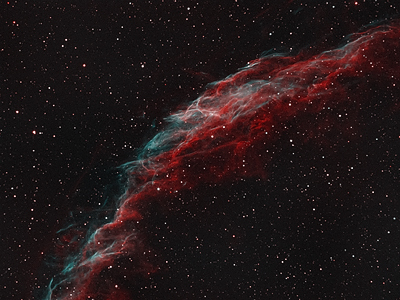 2013/06/03 - Ran two automated sessions on this object with narrowband filters. I shot some extra RGB data to correct starcolors. Seeing was between 2.04" and 2.86" FWHM. 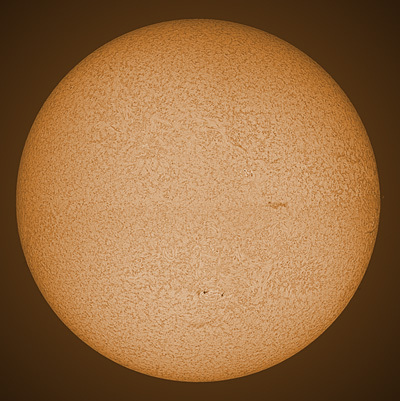 2013/06/02 - My first solar image with my Lunt LS60 B1200 with Pressure Tuner and FeatherTouch focuser. 2013/05/27 - I shot some extra data of The Crescent with the 10" RC and combined it with the data I shot last year with the 10" Newton.I also tried out the AAG CloudWatcher in combination with CCDAutoPilot to be able to pause the imaging session when clouds pass by. At the end of the night clouds were detected and the session was stopped. 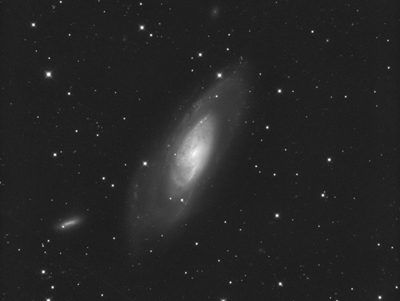 2013/05/10 - This galaxy is still work in progress, because I only had one night of data and it needs more. But seeing was great when I shot this image, it was between 2.09" and 2.43", so that's quite good for this location. Too bad it became cloudy during this night. My permanent Sky Quality Meter is working (see weather), so I can check the best value every imaging session. 2013/05/05 - Conditions weren't optimal, some high Cirrus clouds and seeing was at best 2.35". 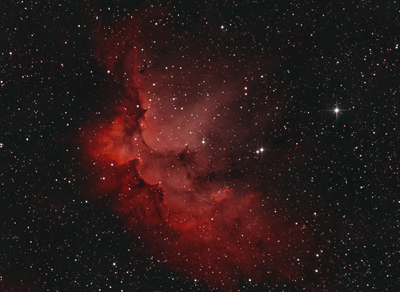 2013/05/04 - It took me 1.5 night to create this image, during the second night it became cloudy halfway the session. Seeing varied a bit, it was 2.31" at best. It also was a bit humid, so transparency could be better. The two sessions were completely automized with CCDAutoPilot, Maxim DL, Autoslew and FocusMax. 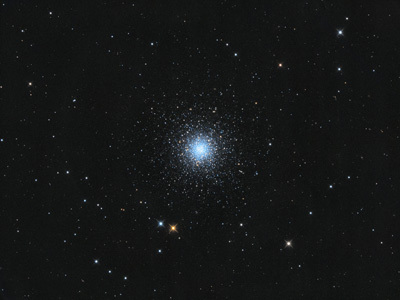 NGC 4725 is the main object, but NGC 4747 and NGC 4712 also show some detail. 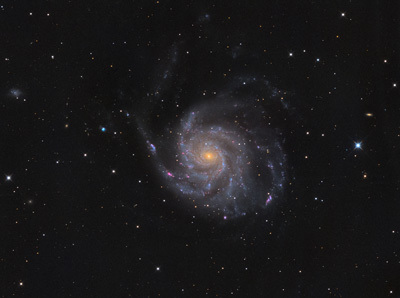 2013/04/29 - I tried to capture this galaxy for 4 nights, but horrible seeing (> 3") and clouds ruined the sessions. So I selected the best data (FWHM < 3") and processed it. Because the flatfieldpanel caused strange patterns, I now tried sky (twilight) flats, that seems to work better. 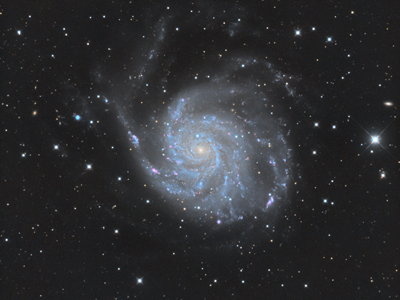 2013/04/20 - I shot M51 a year ago when I started with CCD imaging. 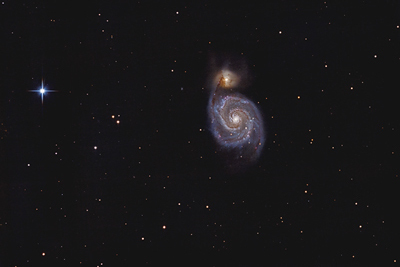 So to compare my astrophotography progress I shot M51 again. This time fully automated, better gear and with better processing skills. The difference is visible. Data is gathered over two nights. Besides M51 and NGC5195 I was able to identify IC4277 (top-left of M51), IC4278 (left of M51), IC4282 (far left of M51), IC4263 (bottom right), PGC2790855 (far bottom right) and PGC2294604 (far right, mag 18). 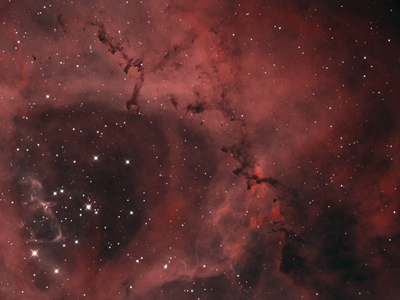 2013/04/18 - It was a windy night, but the ASA DDM60 didn't have any problems with that, I only saw some guiding corrections, that I normally don't see. CCDInspector indicated that seeing was between 2.07" and 2.77". The total session was automated with CCDAutoPilot. 2013/04/16 - My mount went back to ASA in Austria to resolve an USB issue. They replaced the USB board and now it's working reliable again. I needed to redo the polar alignment, tracking model and installation of all the software. M3 is an easy target for this 'first light' after the repair. 2013/03/13 - A lot of things went wrong while shooting this object. My flatfieldpanel broke down, I had USB issues with the ASA mount and CCDAutoPilot decided to guide on a hot pixel again. I could resolve all issues, but I lost valuable clear sky time. A second session on this object went without problems and I was able to shoot the necessary data, more detail is present now. 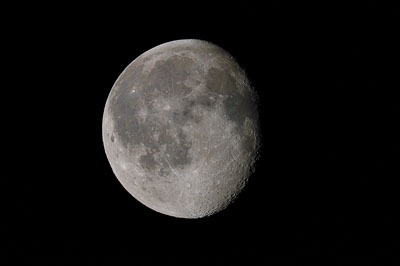 2013/02/20 - Image is shot while the Moon was shining bright. 2013/02/17 - Finally the setup is working as it should. Fully automated with CCDAutoPilot, Maxim and FocusMax. There was some dew on the secondary, so I need a dew heater. 2013/02/11 - I improved the collimation of the RC. Still seeking for optimum parameters for CCDAutoPilot, FocusMax and Autoslew, but I'm getting in the right direction. 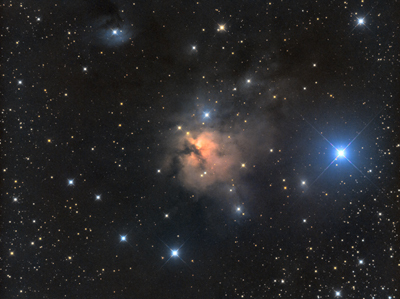 This data is shot during two separate nights. 2013/01/12 - Finally a clear night after ages of clouds and rain. 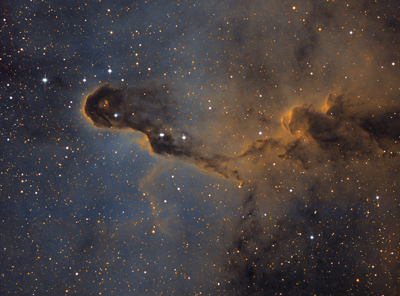 I also tested the ASA DDM in combination with CCD AutoPilot v5 with this image. The only thing a did manually was focusing (no time to get FocusMax up and running). Please note that North is down, so the head is up. Still some collimation errors I need to look at. I hope to add the correct star colors soon. 2012/09/09 - I finally ordered my new setup: the ASA DDM60PRO with a Robtics 10" Ritchey Chretien and Moonlite high resolution stepper focuser. I have to wait for the mount to arrive, but I did pick up the OTA. So this is my first light with the 10" RC. I didn't collimate it and the EQ6 mount was having a hard time (17 kg and 2000mm focal length), but I managed to get a good image. 2012/08/19 - I made some screens, to screen of the lamppost that was causing all kinds of gradients in my images. And with succes, no more gradients. 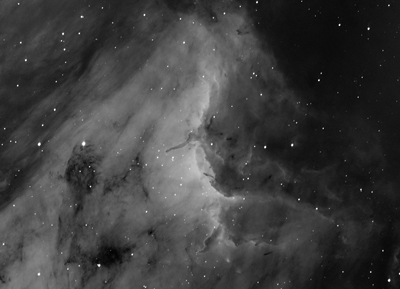 Switched from Nebulosity to Maxim DL, because I want to use CCD Commander, but Maxim isn't as stable as I thought. Sometimes the program becomes unresponsive or a image sequence just stops, very strange. 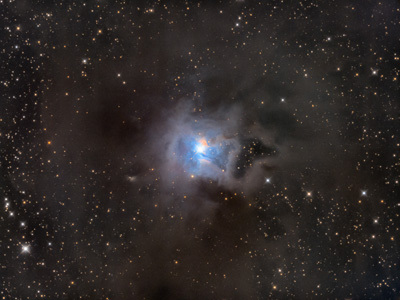 2012/08/03 - A short first night, clouds came in and I had to stop, but still managed to get some data. Still struggling with my coma corrector. Hopefully the weather will be better soon, so I can add some data to this object. Added some extra data and used Maxim DL for capturing and guiding. 2012/07/25 - Used 20 minutes subframes with this object, nights are getting a bit longer. Spend 2 nights on this Bubble. Seeing was ok, but could be better. 2012/07/22 - Finally a clear night after 3 weeks of clouds. Too bad transparancy became bad very fast, so I could only add 1 hydrogen-alpha subframe to my old dataset. I tweaked some parameters of PHD to improve my guiding. I increased min. motion and dropped aggressiveness, and as a result my guiding RMS dropped from 0.41 to 0.25px. 2012/07/02 - I only used DynamcicBackgroundExtraction in PixInsight to remove vignetting and gradients. With larger nebulas it was problematic to remove them with only DBE. So I used my Gerd Neumann Aurora flatfield panel to create my flat frames. So only a gradient remained caused by the moon and light pollution, but that was easily fixed with DBE. 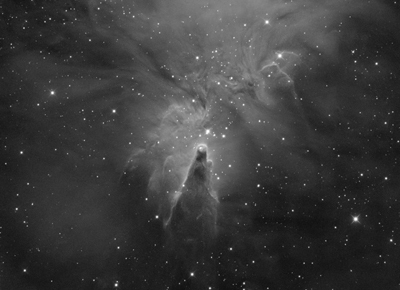 2012/06/23 - The first night imaging this object, transparency became very bad fast. Second night there was a lot of wind, so the stars look bad. I also shot green and blue, so I could combine them to a RGB image. The result wasn't what I expected, so I only used hydrogen-alpha for this one. 2012/06/05 - This is a difficult object, because of the dynamic range. I processed the inner and outer part separately and combined them in the final image. The outer halo's are becoming visible, but for more details I have to add more data. 2012/05/28 - Collimation was a bit off, I really should spend some time on that. 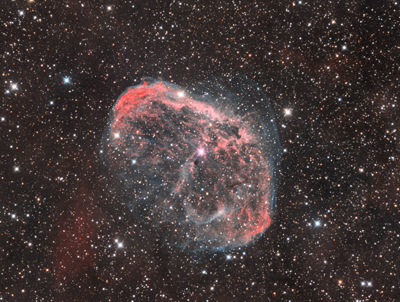 Another narrowband image, I enjoy using these in my light polluted backyard. Seeing was not so good, still got some nice data. 2012/05/26 - I wanted to capture M102, but I had some problems with autoguiding; after calibration PHD lost track of the guidestar. I checked the polar alignment and it was not proper aligned. After realigning the mount it was 1:30 AM, so not much time left before sunrise. 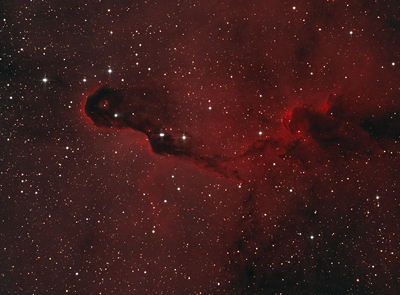 So I decided to capture NGC6992, just to see what I would get. 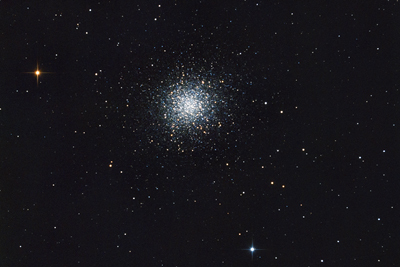 2012/04/29 - M13 is the second global cluster that I captured this night. This second light of the QSI is quite successful, 3 objects in one night. 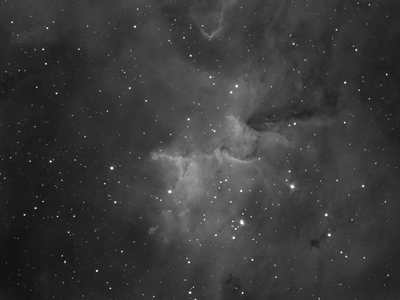 I know it's beter to focus on one object over several nights, but I'm still exploring the QSI. 2012/04/15 - This is the first light of my new QSI cooled CCD camera. It is also my first CCD image. 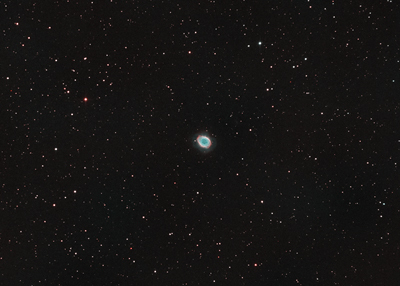 I did a quick (and bad) focus on M51, started PHD guiding and took some LRGB subs. It was a bit windy, so my setup wasn't very stable. The first results were quite good, but there was a gradient because of light pollution and twilight. During the session some clouds passed by, but guiding stayed on target. I didn't take flats. 2012/01/15 - I tried my new filterwheel with Baader LRGB filters on Jupiter today. 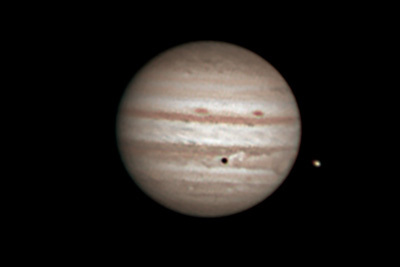 The moon Io is visible at the right side of Jupiter and is casting his shadow on Jupiters surface. 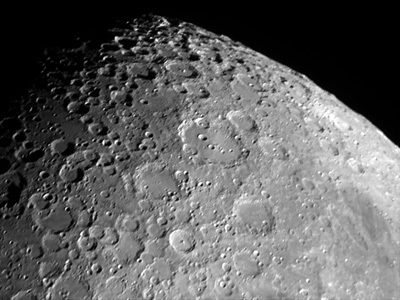 2011/08/20 - I received my new Imaging Source DMK camera today, tried it out on the Moon. 2010/09/27 - My first astrophoto taken with a Nikon D300 DSLR at prime focus of a 10" newtonian telescope.